One of the great aspects of buying jewelry is having the ability to impart your personal style into items, that you, or a loved one will wear for a lifetime. Jewelry is infinitely customizable, and can be build in a variety of ways, for a variety of budgets. Many people think that custom jewelry needs to be extremely expensive, but there are many options in how things are customized. Making something beautiful is really possible at most budgets. The key is the process, and type of customization that someone wants. There are a few way to build a piece of jewelry, each with their own advantages and disadvantages. One of the easiest and most affordable ways to have something custom made is to start with a pre-made setting. There are thousands of designs out there which only require the customer to chose the type and size of stone. Buying an existing casting, and choosing one's stones allows for someone to select the quality and color of stone, or stones, which fits into any one of those designs. The advantage to this is speed and price. There are many settings in the market ready for gems to be set into. They don't require additional design work or processes. And, because they are ready to go, they can be finished in a matter of days. Of course there are a few issues. Typically, they work well for perfectly shaped center stones, notably rounds. Also, they don't allow you to chose how the stones are set (though different design choices do have different setting styles). Making something very personal often requires precise measurements and a greater attention to details. In working with CAD (Computer Aided Design) software, jewelers can build rings which match a client's criteria perfectly. It allows a designer to select, very precisely, all aspects of stones, setting, metal curves, prong shape. It makes it easy to build something based on a vision, then to view it, before it's completed. The software, can then print, in 3D a part in wax. Those waxes get cast in gold or platinum, and then can be finished and set by hand. The advantage of this type of custom piece is that everything is adjustable until the end. Sizes, stones, dimensions. Everything can be modified to make an amazing piece, and adjusted right up until the piece is printed in wax. Of course there is a greater labor cost in developing a model this way. Also, it takes a little time for these to be made. That said, this is the standard process today for building custom jewelry. The process of building a handmade ring is slow and exacting. Done right, it's considered the ultimate way in which to make custom jewelry. But, by today's standards, it's very slow and tedious work, which not so many craftsman know how to do well. As I have outline in a prior blog post, there are quite a few steps in making a fully handmade ring, starting from a raw piece of metal, and finishing in a fully made ring. 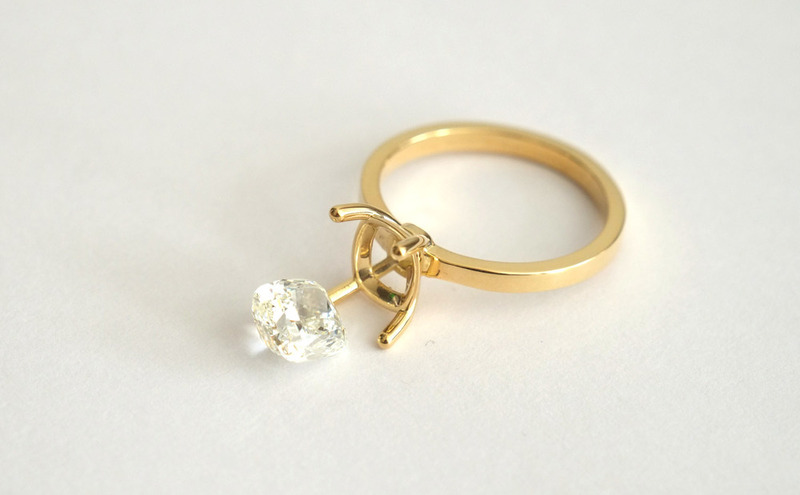 Making a fully handmade ring is, for some, the ultimate in custom jewelry. This however, comes at an extremely high price, is a slow and labor intensive process, and requires patience and time. Making something custom comes down to personal choice and budget. There isn't one perfect solution for everyone, but having options is great. 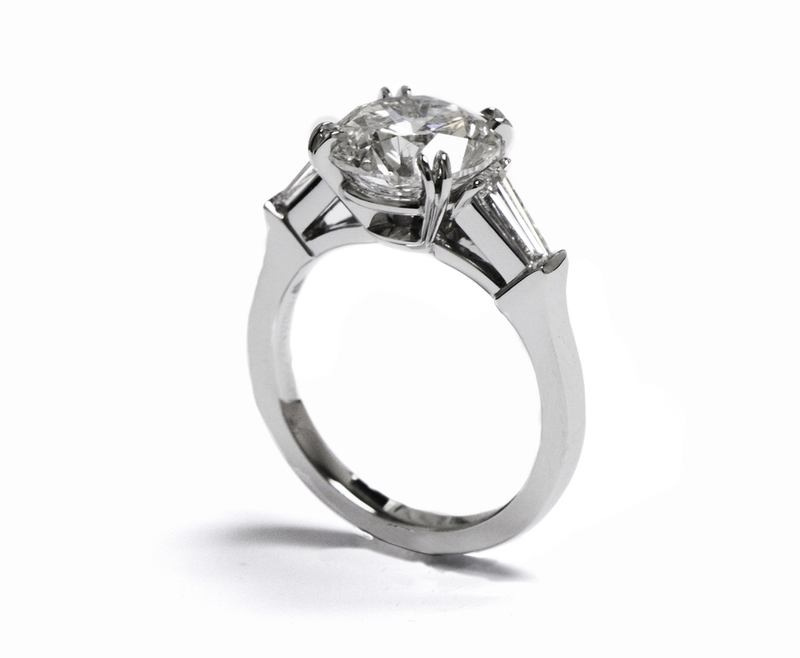 It assures that someone wanting a beautiful custom designed ring can have one in their budget. Exhibiting at a large jewelry and gem show, or perhaps any large trade fair, is a daunting task. It's made all the more difficult when that event is on the opposite side of the planet. For me, doing the Hong Kong Expo in both March and June was a chance to look to a more broad audience for my gem collection. But it did mean flying across the world, and getting to work, right away. Hong Kong is an impressive place. Like New York, a world city, but with it's own unique vibe and of course, Chinese character. The great thing about HK, is that for business, and specifically trade shows, it's terrific. Easy to fly into and easy to clear customs. Also, the gem show (in March) is located right next to the Airport. So it's simple to just fly in. And start setting up. The June show is downtown, in central Hong Kong, with great views (if you do get to step away from the booth. When an exhibitor arrives, the day before to setup, it's usually a mess. Lot's plastic, and bad lighting. That's when a bit of merchandising experience comes into play. As this exhibit needs to express our image, it's important to make it as nice as possible. It takes a while but I eventually get things all worked out and setup the display to my liking. Lot's of little gems are dispersed around some of the larger display boxes, and things are changed out periodically. Throughout the week or so that these exhibitions take place it's extremely intense. People come and go, lots of questions, long hours standing. Also, in HK, there are many customers from mainland China, who don't speak English, so communications is sometimes complicated. Still it's a great experience for me to meet new people from all over the world, who share a passion for fine gems and jewelry. The Tucson Gem and Mineral show comes every February to Tucson, Arizona, and is the largest gem and mineral show in the world. This year's show was even bigger than last, taking place at over 45 venues citywide. It's an overwhelming experience to try and visit the majority of the show, but as it's mainly a wholesale event, most buyers go to the venues in which they have the most business. The show, as always, has sections dedicated to cut gemstones, rocks and minerals, fossils, rough stones for cutting, spiritual items like crystals, native wares and a host of other things. My focus is mostly on the cut gems to the trade, and mineral specimens. This show comes on the heals of a somewhat difficult fall selling season. Because of the turbulence in the stock market, ongoing political issues in Europe and the Middle East, and economic worries in Asia, the expectation were low but people were extremely hopeful. Dealers had hoped that this show would set the market back on track. To some extent that was true, but overall, it was a quiet show and many dealers were feeling the pinch. The first few days of the show I tend to look at the mineral and rough rock exhibits, getting a feel for what new natural wonders I might see. This show had some truly fabulous specimens and it seemed, from what I saw, that the mineral side of the show did quite well. I was looking around for large pieces of carving ruby, and what I found was pretty amazing. These ruby in zoisite blocks from Tanzania were amazing. Rarely do I see such large ruby crystals in these block. The zoisite (green rind around the pink/red ruby) is very limited in these pieces, which means carvings will display much more ruby than is commonly found. Also, the sheer size of the crystals of ruby means large amazing carvings are possible. These blocks ranged in size from about 2kg to about 10kg! I was really impressed! Many of the mineral specimens, not for cutting or carving, were quite impressive as well. There seems to have been great finds all over the world of different minerals that were preserved in their crystal form. Purely for collectors, these types of gems sole purpose is to be gazed upon though display cases by knowing owner. As for cut gemstones, it was an interesting show. I can honestly say that there were fabulous goods in abundance. Trade, however was brisk only for lower priced items. Normally, this means that prices might fall on the more expensive goods, but it doesn't appear to be dropping. Lower quality goods were being sold quite easily, but when it came to the top end pieces, the dealers were not ready to drop their prices. Will there be a correction? Hard to tell. High quality items are still extremely rare, and dealers are waiting for the right clients. On the more everyday side, there were some great finds and beautiful pieces. One such item that I had not seen in abundance in years past were large and well cut natural brown zircon. Keeping with the brown theme, one thing I saw was a great collection of morganites (pink and brown varietys of beryl) - well matched, and calibrated in larger sizes. Peach and brown tones seem popular recently, and these are a great option for jewelry companies looking to make up a nice line of repeatable pieces. The sapphires at the show were great. I saw so many that I wanted to take home with me. Price was high however on the really great pieces. There still was an emphasis on the unheated variety, which has been a trend over the past few years. Though visually indistinguishable from heated gems, these unheated gems command a premium because of rarity. Rounds are Quite Rare in Large Sizes. This Color Change Sapphire Almost Glowed! Blue sapphires have a myriad of color tones. Some brighter, some darker, some more violet and some more green. My favorites have a pure bright blue, and are not overly dark. The larger of the 2 pieces below blew me away. Just such a special piece and color. My personal favorite find at the show was this amazing purple star sapphire. While purple is relatively common in sapphire, the combination of clarity, depth of color, and very nice star made this a big winner! As always the Tucson gem and mineral show has too much to see and look at. In my 7 days out there, I ran around almost continuously. It was, as usual great fun, and a lot of work. The best part of the show however, after spending the day viewing millions of dollars worth of precious stones and minerals, is to spend some quality time with friends I only see once a year, drinking beer and eating pizza. There are 3 main gem and jewelry shows in Hong Kong every year. The largest is generally considered the September show, which draws crowds from around the world looking both to source from the Asian market, and to sell their goods in perhaps the worlds most vibrant emerging market. Expectations this September were however extremely low. For the past several years, the Asian market for gems has been booming, bolstered by a robust Chinese economy, whose citizens seemed to have an insatiable appetite for every sort of gem. From basic tourmalines, to the rarest of diamonds, the world looked to China as their main consumer. In turn, prices went up, as demand increased. These price increases had a detrimental effect on the gemstone and jewelry business in the West. With an already weak market caused by the 2008 financial crisis, price increases worldwide priced many consumers in the west out of the market. However, since the beginning of 2015, the Chinese gemstone market has been slowing. The biggest effects were felt through the diamond market where prices have been dropping precipitously. This culminated in terrible sales at the Hong Kong March and June gem and jewelry exhibitions. And so last week's exhibition had extremely low expectations. But guess what? IT WAS A GOOD SHOW! With low expectations, many dealer just didn't show up. But those that did were pleasantly surprised. It was a busy show, with long registration lines, lots of customers mulling around. Booths were busy. The main issue were prices. Since many dealers have been pushing up prices they have been getting stuck with lots of goods. There was a noticeable spread between the asking price and the selling prices of most goods - meaning, dealers had to move stock and could not just stand by and keep up their inflated prices. This bodes well for the Western markets, as prices come more in line with what consumers expect. While prices have moved up quite a bit, there seems to no shortage of goods. The show was awash in Emerald, with huge stocks of stones in every conceivable size. Much of the goods was of Zambian origin, but there were many Colombian pieces as well. Something very useful which, I saw for the first time, were precision cut Emeralds with excellent color and luster. Typically, I use Tsavorite (green garnets), when I need a rich green accent stone. But these amazing little guys come in sizes from .6mm up to 1.5m with great saturation and shine. And in my hand it's really easy to see how small these stones really are. I also had a long look at diamonds that were available. I'm a lover of unique colored diamonds. Typically, strong individual colors are the most popular, however mixed tones and various color blends can create amazingly beautiful, and unique diamond jewelry pieces. This piece below I fell in love with. A fancy brownish pink, with a slight peach color. Simply amazing!! In addition to the random things I thought were generally beautiful and interesting, I did have a few things I was shopping for to make some custom pieces for clients. I've been working on a diamond link necklace with rose cut marquise shapes and some rubies to fill. I found a great manufacturer who specializes in putting together these types of things. Overall it was a much better show than expected for just about everyone. I personally accomplished quite a bit, as well as catching up with some old friends, and a little free time to run around the city. After being offline for a few months while focusing on family affairs, I am starting up again sharing images and stories from my gem and jewelry world. Over the last months I have worked on a bunch of new custom pieces for customers of all different budgets. I wanted to share this piece with you because it's brilliantly simple and elegant. A few months back a friend came to me wanting something timeless and understated, to give his girlfriend as a proposal ring. The key was that he wanted it to have that 'Wow!' factor when she opened the box, but without being overdone. Every woman wants to be overwhelmed when they get a proposal, and having supreme sparkle goes a long way. Choosing the right cut has a big impact on the type of sparkle you get. In this case he went with a cushion cut. The stone chosen was a GIA certified 1.87ct cushion cut. The key feature of this stone is that it's really a spready stone with the length and width similar to that of a stone roughly 2cts. giving it a big look. Also, because of the number and placement of the facets cushion cut stones have, they reflect really brightly as compared to many other cuts. In a word, Presence! This stone had presence which made it stand out in the sea of similar stones. The idea was to do something simple and contemporary, in which the center stone stands out, without the ring being overdone. Also, my friend wanted to have it done in a rich 18k yellow gold. 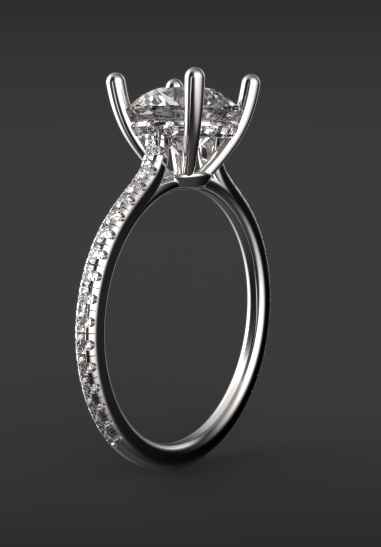 We designed out a simple four prong setting with a rectangular band, and had it CAD modeled to fit the stone correctly. The final result: A simple and elegant ring with sparkle and presence, suitable for a lifetime together. When people think of what a "diamond district" should look like it's no surprise that visions of New York's 47th street come to mind. Not only is it the worlds largest wholesale gemstone and jewelry street, but it's ground floor wholesale/retail jewelry shops bring people from far and wide to gaze at sparkling gems, as well in hopes that they will get a deal. The jewelry business came to midtown Manhattan during World War 2, as Jewish diamond and jewelry merchants, fleeing Europe, settled their businesses in this area. Today, many of these businesses live on alongside new businesses opened by waves of more recent immigrants, mostly from formerly communist Eastern Europe. Every facet of the jewelry and gem business is covered in this area. From small scale retail establishments to large diamond and gem dealers, to online retailers. It's a busy block with an enormous amount of revenue generation. It's estimated that the street turns over roughly $24 billion yearly. There are deals to be had, but it all depends on what items people are looking for. I advise working with someone trusted in building valuable jewelry pieces such as engagement rings. These are quite expensive purchases, and hopefully pieces that are kept for a lifetime. For simple things however, the exchanges might be worth a look. Typical things, like simple gold hoop earring's, thin diamond bands, or very small studs, can sometimes be good buys in the exchanges. These are all items which many vendors keep in stock and want to turn over. Also, these are typically lower priced items, which are good for fast gifts, or just to wear as everyday pieces. For more important pieces (pieces over $1,000), diamonds over 1/2ct and really anything special, I always feel it's better to work with reputable people. Buying expensive items is daunting, and requires honest guidance to make sure you get a quality item. 1. Know what you want and comparable prices for those items. 2. Ask for certifications - GIA specifically - and don't allow someone to sell you something with a very high grade from a sup-par laboratory. 3. Don't get pressured into buying things. 4. Work with trusted people first. 5. If you need something like this 6ct round G VS1. Call us first!